The sea covers 99% of the Maldives and inside its blue depths lies the mysteries and riddles related to the formation of the Maldives. The islands are formed around a ring shaped coral reef encircling a lagoon. This reef structure, typical of Maldives, is called an atoll. 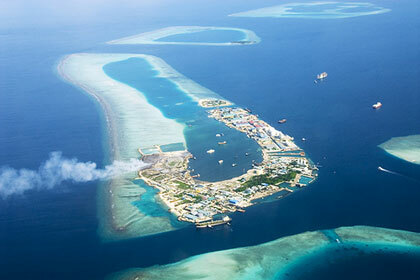 In fact, the English word 'atoll' itself is derived from the Maldivian or dhivehi word for it-atholhu. There are 26 natural atolls in the Maldives. There are still ongoing debates about the formation of atolls. According to Charles Darwin's theory, when submerged volcanoes rise from the sea, a coral reef grew on its edge. When the volcanoes submerged, the coral reefs encircling a water-filled basin remained. Consequently, islands were formed on the reefs as the tides and currents brought dead coral onto sandbars. These were in turn colonised by plants. A different view has been provided by Hans Hass. According to him, layers of coral reefs might have built up on top of the submerged mountains until they rose to the surface. The hardest and highest corals remained while the weaker corals in the center of the coral platforms broke down. The remaining corals at the outer edges formed rings that were to form the outer rims of atolls. Islands were formed as debris and sand accumulated on to the remaining reefs. The reef is cut by deep channels, which the locals have mastered to navigate. Protective reefs safeguard the islands from the elements. However, the islands are susceptible to erosion. The islands are low-lying; emerging almost two meters above the sea level. It is frequent that one part of the island to erode while onto another part the currents and tides deposit sand expanding the island. Over the course of time, some islands may erode completely, while others may be formed gradually on a sandbank. There are still many islands and sandbanks at various stages of formation. Hence, the Maldives is a dynamic country in the making. Six inches deep humus forms the initial layers of the soil. Sandstone of about 2 feet is found below and after it sand is accompanied with fresh water. The salinity of the soil along the beach restricts the growth to few plants. Normally, shrubs and small hedges occupy the area. More inwards, banyan, mangroves, screwpine and other lush vegetation are found. For the coconut palms there seems to be no restrictions. It is found almost everywhere and have contributed significantly to the local lifestyle, even earning the status of the national tree. While vegetation in the islands is limited, it is supplemented by the riches of the sea; varieties of corals, abundant colourful fish and other organisms that makes the Maldives 'the home of the children of the sea'.